Jerome's Appliance Gallery – Experience the Difference! Jerome Curran and his staff invite you to visit our contemporary and unique 7500 square foot showroom to “Experience the Difference” first hand. At Jerome’s Appliance Gallery you will find our professional sales team to be friendly and expertly trained in luxury appliances. Our Bistro features live appliances for a “hands on” experience before purchasing your appliances. We are proud to be home to the Wolf & Sub-zero “Living Kitchen” concept. It features over 50 full size Wolf and Sub-Zero appliances beautifully displayed in all their many applications. 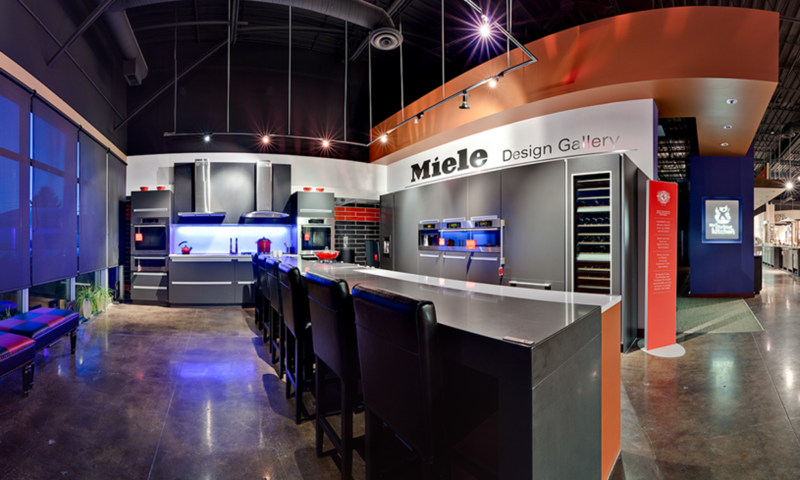 Be sure to check out our Miele Design Gallery, which showcases all of the finest products by Miele; like the built in coffee system, the steam oven, and the fabulous Miele dishwasher. We carry high-end appliances from all over the world; Italy, France, Germany, Sweden and England, just to name a few. Some of our other full line brands such as Jenn-Air, GE Monogram and DCS are also featured in kitchen settings allowing you to see appliances properly displayed and installed; giving you some great ideas for your dream home. We look forward to meeting with you and guiding you through the purchase of your major appliances with special care and attention to all your individual needs. We also welcome designers, builders, contractors and renovators to drop by and meet with Jerome and his dedicated staff.